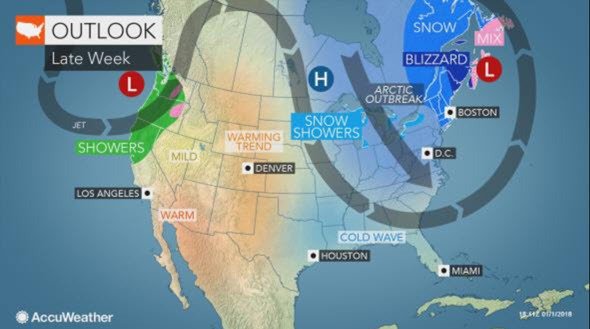 AccuWeather Global Headquarters – January 3, 2017 – AccuWeather reports a major storm will track close enough to the East Coast of the United States to bring everything from snow and ice to blizzard conditions and frigid winds on Thursday. The storm is projected to undergo rapid strengthening, referred to as bombogenesis. The storm will affect areas from Florida to Maine and Atlantic Canada. Snow and a wintry mix are set to continue along the southeastern coast of the U.S. through Wednesday night. In the Northeast, impact from snow and wind will increase dramatically from Wednesday night through Thursday night. AccuWeather meteorologists believe the heaviest snow and strongest winds from the storm will occur in eastern New England and part of Atlantic Canada. Road conditions will range from slippery and snow-covered along the mid-Atlantic coast to completely blocked with snow and massive drifts in eastern New England, New Brunswick and part of eastern Quebec. All flight operations may cease for a time at Boston Logan International Airport during the height of the storm. Airline delays and cancellations will mount. Ripple-effect delays may occur across the nation. Some aircraft and crews are likely to be displaced by the severe storm in New England. Deicing activity, slippery runways, poor visibility and gusty winds will lead to flight delays in New York City and Philadelphia. From eastern New England to Atlantic Canada, there is a risk of widespread power outages. Tremendous blowing and drifting snow is likely, and some communities may be isolated for several days in the wake of the storm in the bitter cold. Increasing winds along the New England and upper mid-Atlantic coast will cause overwash, which will freeze, in addition to causing shoreline flooding. Blizzard conditions are likely from portions of Long Island, New York, through eastern Connecticut and Massachusetts to northeastern Maine, New Brunswick and western Nova Scotia. A blizzard is a storm that produces snow or blowing snow with winds in excess of 35 mph and a visibility of less than one-quarter of a mile for at least three consecutive hours, according to the American Meteorological Society. There is the potential for 12-24 inches (30-60 cm) or more of snow to fall in Maine and New Brunswick. At the same time, the risk of hurricane-force gusts and frigid air will pound these areas. The storm is expected to track close enough to the coast to throw snow on the area from eastern Virginia and the Delmarva Peninsula to New Jersey, eastern New York and western New England. Blustery conditions will develop during the snowfall or shortly thereafter. Whether a few flakes of snow or a debilitating snowstorm occurs in this western fringe will depend on the exact track of the storm and how quickly moisture is thrown westward as the storm strengthens. In the coastal states from Virginia to New York, areas farthest east are likely to have the greatest amount of snow from the storm. Little to no snow may fall in Albany, New York, Washington, D.C., and communities west of Philadelphia. However, the amount of snow will increase substantially a few miles farther east. Coastal communities that usually receive wet snow or a rain/snow mix from storms can expect dry, powdery snow from this storm that will be subject to blowing and drifting. Snow showers may occur from the mountains of central New York to the southern Appalachians and parts of the Midwest. However, these will be more of a product of a fresh injection of cold air, rather than from the storm at the coast. Minor airline delays from snow showers may occur in the Chicago, Detroit, Pittsburgh and Cincinnati airports. Lake-effect snow is forecast to ramp up once again near the Great Lakes. As the storm strengthens, winds will increase hundreds of miles away from the center of the circulation beginning Wednesday night. Winds alone are likely to become strong enough to trigger airline delays in the major hubs of the Northeast, from Washington, D.C., to Philadelphia, New York City and Boston from Thursday to Friday. Strong offshore winds may lead to blowout tides along the mid-Atlantic and New England coasts. Blustery and cold conditions are in store as far south as Florida, the Bahamas and Cuba. The strong winds and arctic air will add to the frigid weather pattern. Seas will build to dangerous levels for small craft off the mid-Atlantic, New England and southeastern Canada coasts. Previous Previous post: What is bombogenesis?